Before We’re Gone is a sumptuous exploration of second chances. 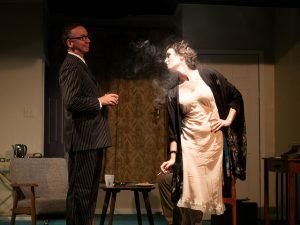 It has the rhythm and smell of nostalgia –like you are watching a lost play of Lillian Hellman, Tennesee Williams, Arthur Miller or Edward Elbee. The characters are meticulously drawn and we fall into their lives like a Saint Bernard on an old sofa –its immensely satisfying and comfortable to experience. Every element of this production is a memory trigger and it feels like you are walking with an old friend in deep conversation dissecting roads taken, paths avoided and future forks worth navigating. The rich, potent text has been written by Jerry Small. The work moves between two different hotels in different time periods. He introduces us to Kathleen McGuire in 1981 – a legendary Pulitzer-winning playwright who has absconded from her high-profile existence in New York and Hollywood to a calming seaside motel in Santa Barbara. She is on the precipice of a major life decision and has closed the curtains on the limelight. An unexpected knock on the door brings an invigorating conundrum into the mix. A person she has not laid eyes on in 25 years arrives and injects his way into her world so that they will both be fundamentally changed by the encounter. We then return to 1956 to see their first meeting. McGuire has run into McCarthy trial mayhem and is lying low in Reno at the Famous Mapes hotel to continue her writing and ensure her six-week divorce takes effect. When the air conditioning unit goes on the blink, Richard Flynn arrives to cool her down. He is on a sabbatical from his Franciscan order to be able to wrestle with his doubts concerning his faith, his future and himself. The two become embroiled in an intense relationship born out of curiosity and admiration. We then get catapulted into 1981 again for the resolution. It’s riveting, surprising and bitter sweet. Joe John Battista’s strong directorial vision is evident in every moment. You see his experienced hand in the beautifully detailed, character work. There is evidence of intuitive blocking, intensive script exploration and complex emotional layering. It is a joy to watch the story unfold in his very capable hands. Leenya Rideout as Kate (Kathleen McGuire) epitomizes sophistication and grace with a wicked twinkle in her eye. She perfectly captures Kate’s alpha female, warrior heart who is courageous in the face of restrictive societal norms. Rideout give us a character totally comfortable in her skin. Kate is eating life like a melting ice-cream not letting a lick go to waste. She is sensual and expansive in the role with a mighty presence that fills every inch of the West 13th Street space. Her Kate oozes star quality and maintains her power even as her life transforms from ecstasy to agony. It’s a gorgeous role inhabited by a luminous performer. John Zdrojeski as the guilt ridden priest straining against his vows, is magnetic. He is a striking performer able to command the stage with a maturity beyond his young age. Zdrojeski plays Rich Flynn with a powerful physicality and excellent comic timing. His transformation from innocence to jaded “imposter” adult was exquisite and he conveys complex emotions with sensitivity and depth. As Rich, he has the audience (and Kate) eating out of his hands especially in the scenes of his internal combustion brought on by rampant, burgeoning sexuality. Zdrojeski and Rideout have incredible onstage chemistry that threatens to set the house on fire. The frisson between the characters is palpable and totally believable. Jay Russell plays a fortune of characters with such skill and versatility. Each small cameo of his had a completely different essence, physicality and vocal characterization. He seamlessly transformed from the one to the other like Madame Blavatsky at a busy séance. I adored his gentle portrayal of Barney –Kates agent, Rich’s brutal father, the manipulative, repressed priest Fr. Cyprion, the self absorbed husband Mark, the long time lover Myron – each man brought to life with meticulous attention to detail. Russell is like slow release vitamins – it’s a gift that keeps giving -hours after you take them in. Emily Juliette Murphy brought her 50’s screen siren style radiance and sincerity to every one of the small roles she played. She lit up the stage with her portrayal of Kate’s nurturing mother, the officious motel clerk and the cordial, sparkling waiter. Murphy has the elegant presence of a classical ballerina. She seems to glide onto stage with purpose and focus that seems effortless. One of my most favorite things about Before We’re Gone is Brian Dudkiewicz set design. It is a portal back in time as each authentic item acts as a memory spark to a bygone era. The hotel rooms looks like a double spread out of a house and home magazine from the 50’s and 80’s. I particularly loved the 50’s styling and period pieces. My eyes were feasting on the visual smorgasbord of mid-century modern side table, decanter and typewriter. Pure bliss! Costume designer, Martha Bromelmeier brought some old world charm into her evocative designs. You feel like you are watching a sizzling James Dean in sports jacket and light woolen pants alongside a sultry Natalie Wood in her silky nightgown and kimono. The outfits were simply gorgeous. Joseph LoDuca created the romantic, old, sepia photograph style sound memory with his original music underscoring the show. Allison Hohman crafted the atmospheric lighting states that expertly revealed the character’s emotional states. All of these production elements are artfully executed and it feels like you are watching an old classic movie where every part comes together so powerfully it tickles your feel-good muscles. This classy, sensory explosion is brought to the 13th St. Repertory Theatre Company by Bahr Productions. Running time: 1hr 50 minutes with one 10-minute intermission. What a fantastic review! I saw the play a few weeks ago and am going to take a friend to see it again on Saturday. My mind is still fresh from “Angels in America” and some of the themes and set elements from “Before We’re Gone” reminded me of “Angels.” This was my first off-off Broadway show and I was blown away! The performances were jarring!